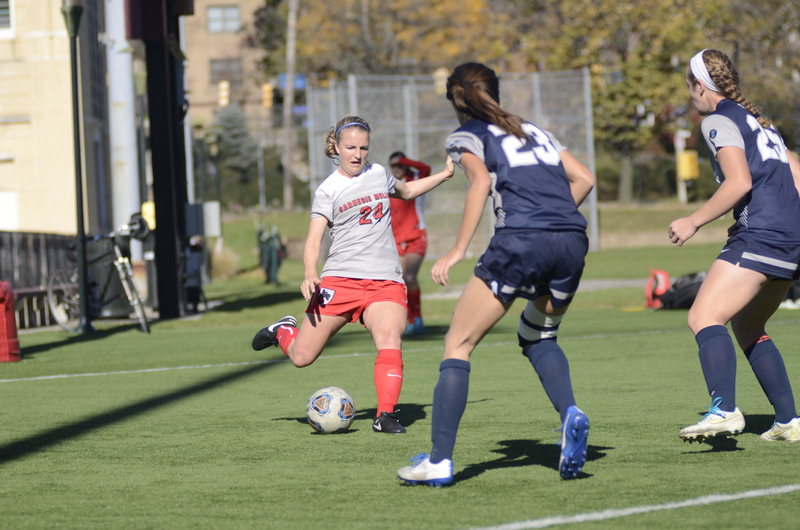 The Carnegie Mellon women’s soccer team played their final match of the regular season on Saturday against University Athletic Association (UAA) rival Case Western Reserve University. The Tartans were victorious by a score of 2–0, and they end the season with an overall record of 11–5–1, and 5–2 in UAA play. The game got off to a slow start, but the Tartans controlled the pace of the game despite there being no score for the majority of the first half. The Tartans continued to push into Spartan territory and apply considerable pressure until they finally broke through the opposing defense. In the 42nd minute, first-year forward Sydney Webber scored her first goal of the season after junior midfielder Morgan Kontor sent a pass from the sideline to Webber. Webber connected with the ball as it was in the air and made a quick shot that flew past the Spartan goalkeeper and into the back of the net, earning the Tartans their first concrete lead of the game. This was only the only successful goal attempt out of the Tartans’ nine in the first half, but the lack of accuracy didn’t matter as the Spartans didn’t attempt a single shot on goal in the first half. The Spartans did manage to find two shot attempts in the second half, but senior goalkeeper Katie Liston shot both down. The Tartans continued to stifle their opponent until they broke the game wide open in the 89th minute. The Tartan defense cleared the ball out of their territory and junior forward Sienna Stritter found the ball, taking a long shot over the head of the Spartan goalkeeper and securing the win for the Tartans. Carnegie Mellon places second overall in the UAA standings with this win. 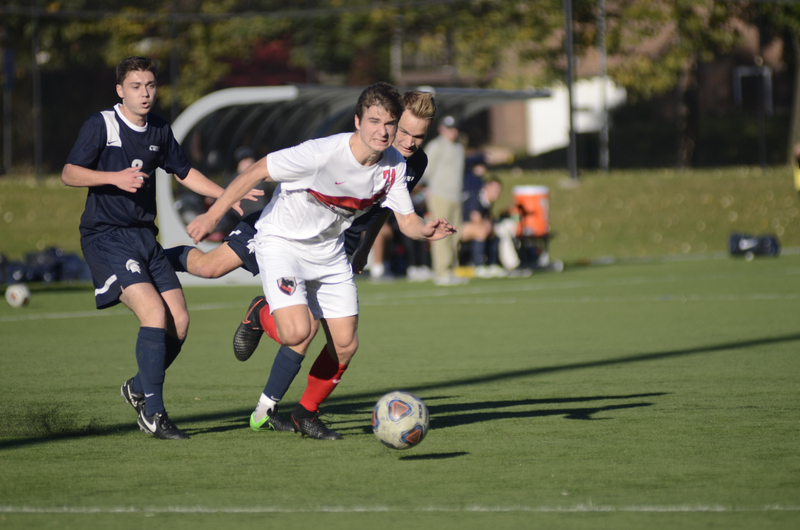 The Carnegie Mellon men’s soccer team also faced off against Case Western Reserve later that day and found the same result as the women’s team, winning 2–0. The men’s team ends their season with an impressive record of 12–3–2 and 3–2–2 in the UAA. This game for the Tartans was all about sophomore midfielder Zack Masciopinto, who scored both goals on the night and completely took over the game with the help of his teammates. The Tartans started making plays as early as possible, and they made the best of their early aggression in the second minute when the Tartans scored for the first time. Senior forward Devin Keane was credited with an assist as he launched a pass across the front of the goal to Masciopinto, who connected with the ball and headed a shot straight past the Spartan keeper. The offense wasn’t the only thing dominating for the Tartans, though. Sophomore goalkeeper Alec Lam maintained the one score advantage for the Tartans with two critical saves in the first half, including a save on a free kick in the upper corner of the net. The scoreboard remained the same for quite some time, but the Tartans made another push to score in the 67th minute. The play began with sophomore forward Anthony Gulli making a forward pass to Masciopinto deep inside enemy territory. A defender slid to stop his momentum, but Masciopinto hurdled the player and recovered the ball, immediately taking a shot that went right past the Spartan goalkeeper. The game would end with the score of 2–0, and now the Tartans wait to see if they will get a bid for the 2016 NCAA Division III Championship, set to begin on Friday, Nov. 11.